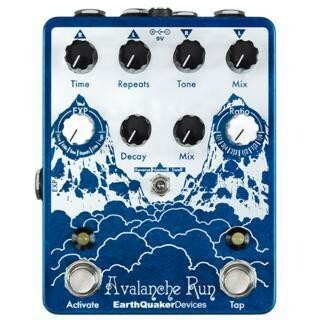 The Avalanche Run by EarthQuaker Devices is a dreamy sonic discovery device with up to 2 seconds of delay time and a lush reverb. It features complete control over delay time, repeats, mix and voice (with the tone control), as well as control over the reverb length and mix. It can run in one of 3 different modes: Normal, Reverse and Swell. In “Normal” mode, the Avalanche Run functions as a straightforward delay and reverb. In “Reverse” mode, the delay line is in reverse and the reverb remains in normal mode. In “Swell” mode, the Avalanche Run reacts to your picking dynamics and adds a volume swell to the entire signal path much like manually raising and lowering the volume of your guitar. The Tap switch also has a few other cool secondary functions. While in Normal and Swell mode, you can send the Avalanche Run into self-oscillation by holding down the “Tap” footswitch. In Reverse, mode holding down the Tap switch will flip the delay back into Normal mode and return to Reverse mode once released! Each and every Avalanche Run is completely assembled, wired and tested at the EarthQuaker Device's headquarters in Akron, Ohio. For complete Specs and Control information, see the Product Manual in Product Attachments below!